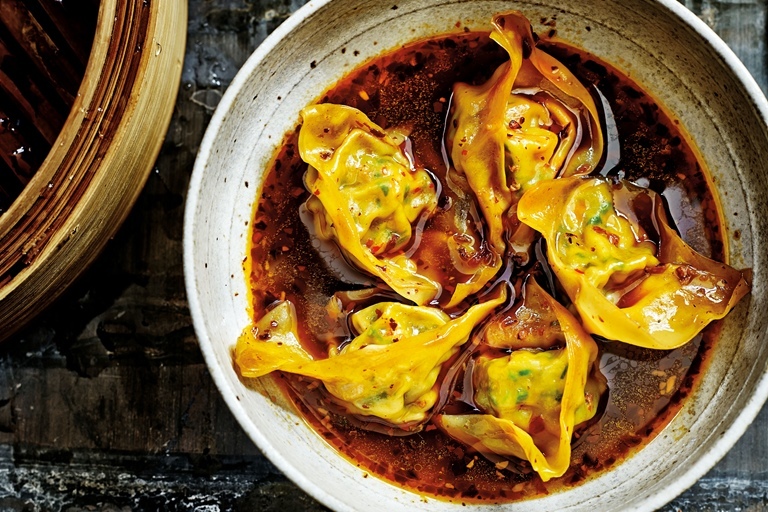 These steamed wontons in chilli broth from Jeremy Pang can be made ahead of time and frozen, making them perfect for a dinner party. Try folding them into the traditional gold ingot shapes to bring your friends and family wealth for the years ahead. wheat flour (similar to plain flour), hot water and oil. The method of folding below creates a shape much like a gold ingot (pre-20th century Chinese currency) and it is said that if you can fold your wontons in such a shape, you are giving your friends and family plenty of good wealth for years to come! Tip: Dumplings like these can be kept in the freezer once made. They must be cooked from frozen for 2 minutes longer than the recommended cooking time when cooking fresh, rather than allowing them to thaw out and lose their shape.